Yesterday I went down to Stockholm for the first time since last summer. It was also the first time in a year I was able to ride a train. I also found a cheaper and shorter way to get there than before. It was good. The price with SJ (the government owned company) was $11 one-way. With the Stockholm commuter train it cost around $9 one-way, but then I didn't have to ride the subway to YFU, the train stopped just a couple of blocks from the office. However, when I came there, there were only couple of students there and a few volunteers. A few people came later, and I think we ended up being nine students, five returning students (three from America and two from Europe) and three or four students that are leaving in a month. We were four guys from Uppsala, which was pretty cool. One of them was a student at my school. Another guy thought he was going to Colorado, they were just waiting on the school to accept him. I told him Colorado is the best state in the country! Who knows, it might be Fossil Ridge he is going to? This was also the day I realized that my exchange year didn't stop just because I went back home to Sweden. There are sooooo many opportunities to take after the year is over! I signed up to be a volunteer and work with campaigns to find new host families. Former students can also apply to work/volunteer at another YFU office all over the world, how cool isn't that? They also told us Sweden is the fourth largest YFU-organization to have students coming in to the country next to USA, Germany and France. This year was a record year with ninety students coming in August, 70 Swedish students are leaving Sweden to study abroad next month. Alright, I'm back from the summer house for a week in Uppsala. 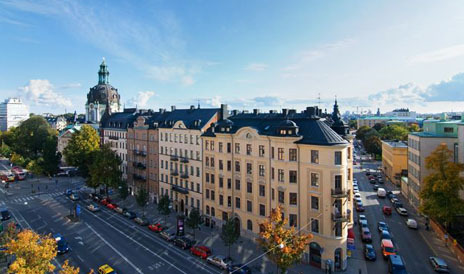 On Saturday I'm going down to Stockholm for a YFU-meeting with old and new students. It's going to be fun and I'll meet people I haven't seen since February or last summer! Something good has happenned in Sweden, we have had sun for three days in a row! It's rare for this summer! Today is fourth of July and the Independence day of the U.S. I hope I will be in the country on this day in the future. I have heard it's a very special day with fireworks and celebrations all over the country.